This June was one of my favorite Junes ever. It probably helps that I finished up as a full time employee in May, and am now contracting (20 hours per week) and working on personal projects, like my job search ebook. I gave myself permission to take it easy for a bit, so I'm not pushing myself particularly hard on the personal projects. I'm clocking in with about 30 total hours of work each week. I'll pick that up to 35 to 40 hours soon, but I needed a little bit of time to decompress first. I've been going for a run by the bay twice a week. I don't particularly love running, but I dislike shopping even more, and my pants were feeling a bit tight. I thought about finding a gym to join, or getting back into the habit of kickboxing in my garage, but then I looked at the beautiful blue sky and felt the wonderful ocean breeze... and I put on my running shoes and headed to the bay. I've been getting steadily better. I run the same route every time, so I can tell that each time, I make it a bit further before I have to stop and walk for a bit. With the beautiful weather, the nice location, and some good songs on my iPod... I've actually found myself smiling during some of my runs. We've been eating outside more often, too. A couple of years ago, my summer was going much less well. It felt like it was passing me by, in fact. So I did what I usually do when I have a problem to solve: I wrote a list. It was a list of fun things I wanted to do that summer, and one of the things I put on the list was "eat outside more often." I honestly think that one item alone turned around how I felt about that summer. Ever since then, I've made it a point to start setting up dinner outside a couple of times per week once the sun starts staying out longer. I don't do anything fancy- most of the time, I can't even be bothered dragging our regular outdoor dining table out from the side of the house to the yard. Instead, I carry the kids' blue Little Tikes table out into the yard. The kids sit at that table and Mr. Snarky and I sit in our plastic Adirondack chairs and eat half over the table, half over our laps. We have more exciting items on our Summer Fun List, too: going to the Zoo at Night, going down to watch the Sea World fireworks from the bay, and having dinner at the outdoor restaurant in Old Town are favorites. 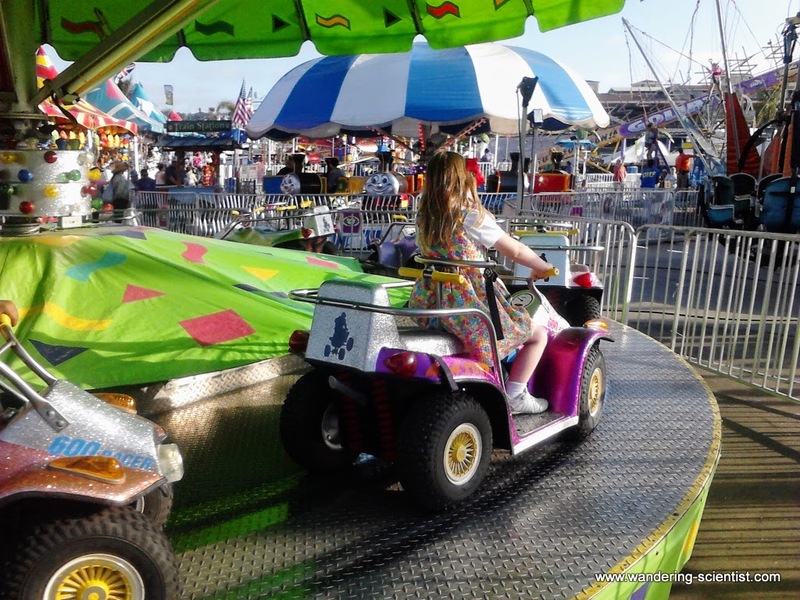 The kids also always want to include a trip to the San Diego County Fair. We missed it last year, so I made a point of getting a visit scheduled in this year. I am glad we did. We had so much fun. We went earlier in the season than we usually do, and we went on a Thursday afternoon/evening, so the crowds weren't huge. The kids rarely had to wait in line for a ride, and we were able to find a place to sit whenever we needed one. Petunia enjoyed feeding some goats and sheep. 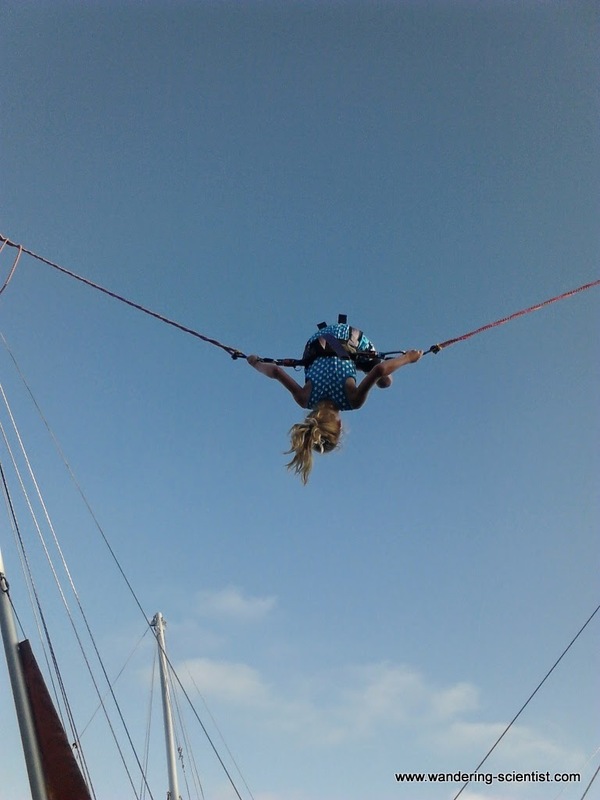 That's Pumpkin bouncing into the air on a trampoline, while strapped into a bungee-corded harness. And doing back flips. Petunia went on the trampoline contraption, too, but didn't do any flips. She loved the various kiddie rides- trucks and trains and boats, going around in circles. She also had a lot of fun "fishing" for a prize. The woman running the game was nice and made sure she won one of the medium prizes. Pumpkin did, too, and they were both thrilled. And of course, we ate some fair food. Petunia chose cotton candy, and Pumpkin went for a snow cone. Mr. Snarky, on the other hand got over his disdain for the name "Australian Battered Potatoes" and had some potato fritters, and I pretty much bounced with joy when I saw a stand selling Navajo fry bread, which was the fried batter of choice at festivals of my youth. One of these days, we're going to take Baguette to the Ventura County Fair (we live in L.A. County, but the Ventura fairgrounds are closer, and we hear the scale of the fair is smaller, which is better for Baguette). It sounds like all of you had a great time! We don't eat outside a lot, but a couple of weeks ago, Bestie and her mom came over for dinner, and Bestie really, really wanted to eat outside. Our back patio is perfect for al fresco dinners, unless it's being used as a woodworking workshop--which is the case. So rather than police two small girls around dangerous equipment, Mr. Sandwich set up a table in the front yard. It may not have been your typical outdoor dinner, but we all had a great time. Helps to be in San Diego! I'm trying to eat outside too, but the humidity and mosquitoes are a bit...trying. But I love county fairs. They're so perfect for little kids and yes, any fried dough product is awesome.